8mm, Super 8mm and 16mm Digital Film Transfer Services in Stunning HD! When quality counts, you've come to the right place! Our Frame by Frame Film transfer is simply the best way to transfer film to digital and we use the same equipment that the Academy of Motion Picture Film Archives in Hollyood uses to archive their films! Bring back those images of days gone past, in stunning resolutions of 2K (2048 x 1536) or High Definition (1920 x 1080) ! We transfer color Positive or Negative film, and either magnetic or optical audio tracks with your film. You pick the the output format of your film - DVD, Blu-Ray, or Digital file. Plus, we keep a digital copy of your film transfer project for 30 days from the time your order is done, at no additional charge! The best flicker free digital film transfer available! We clean and lubricate your film, and fix any broken splices as part of our service. You’ll receive these back in better condition then when we received them! All of our film transfer is Frame by Frame scanning at your choice of 2K (2048x1536) or HD (1920x1080) resolutions. Utilizing an enlarged gate, we capture the entire frame of your film – nothing lost and no over cropping! Our HD scanning is in a 4:2:2 color space, so color correcting can be more precisely obtained on each RGB channel. We also include background music with all our film transfers at NO CHARGE! Choose your output format: DVD, Blu-Ray, or Digital File. See our 5 Step Film Transfer Process for more information. Large Volume? Call us for additional discounts on film transfers. Why is true Frame by Frame HD Digital Film Transfer the BEST? 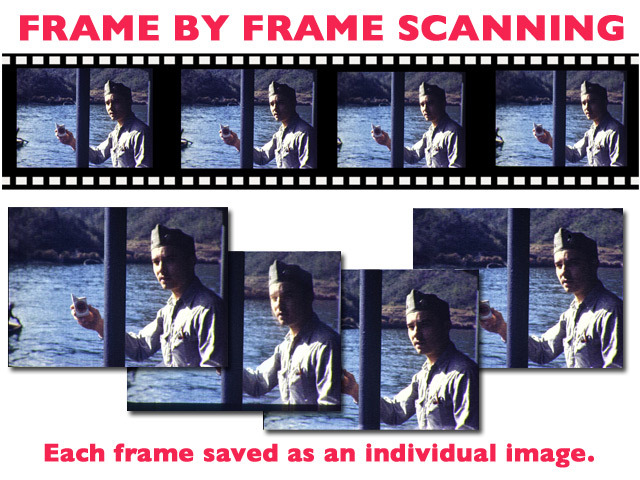 Frame by frame digital film transfer delivers stunning quality because we actually scan EACH frame of your film. Scanning directly off of your film means NO condenser lens or mirror assembly and NO optical distortions. Most of all, the light source in our systems is a “no heat” diffused ultra-cool LED light source, so your film will never be burned or stressed by a hot lamp. And YES, we can handle either color Positive or Negative film! We use the same equipment that the Academy of Motion Pictures Film Archives in Hollywood uses to archive their films! Whether you’re an independent producer or just trying to preserve and transfer your family’s home movies, you can trust you'll get the best flicker free, high quality digital film transfer available. 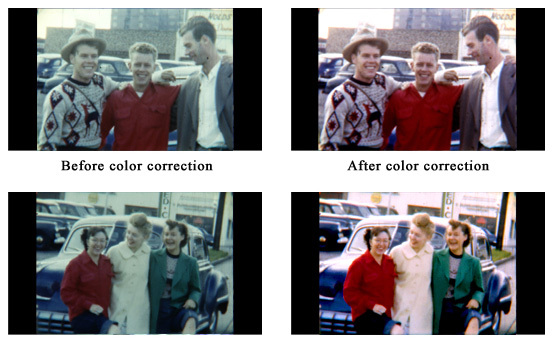 Do you need Color Correction with your film transfer - YES!! Let our experts reverse the passage of time with our color correction! Even with well stored film, it will start to chemically break down and oxidize, creating a blue or pink hue to the images. We strongly recommend this service with your film transfer so you can relive those past moments to their fullest, all for a minimal cost of .10/ft. See what noise and grain reduction can do for you! When we scan your film, we capture a high-quality, very detailed image of each frame. All film has a grain to it and film will have some level of scratches and imperfections from use and handling, or simply from aging. 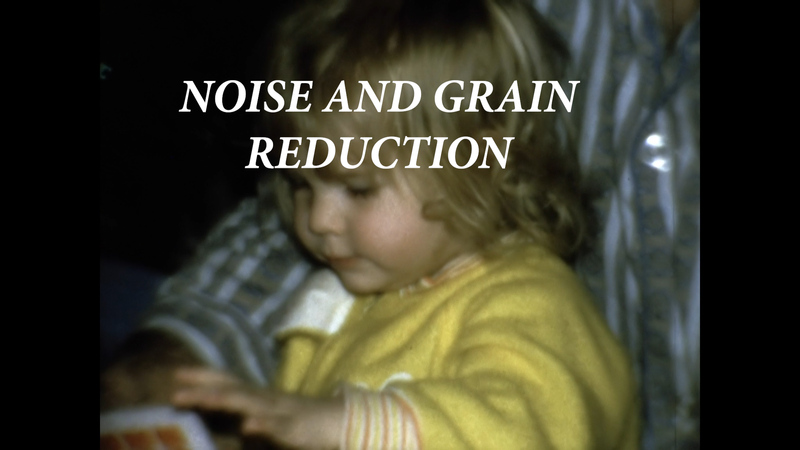 With our noise and grain reduction, we can smooth that out, so you get a more pleasing & natural look to your film. This process will also remove small scratches and specs on your film, again making your film more pleasing to the eye. Please view the video Full Frame to see the difference! Need extra copies of your film transfer project? Don’t forget to share this long lost footage with your favorite relatives and friends! See our film transfer pricing for extra copies! 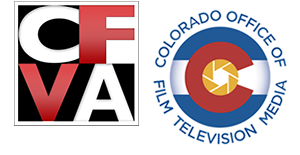 Not in Denver and need to have your film transferred? Carefully package your film and send to us. Use a service that can track your package, such as FedX or UPS. Upon receipt of your order, we will call or email you, and confirm the scope of work needed. Until we have your job completed, we will not know what the exact length of your films. At that time will ask for payment prior to us shipping. Any questions please give us a call! Do you have 35mm slides? Visit our 35mm slide conversion page! Get your film transfer started and preserve those memories NOW! I can’t tell you how much I appreciate the hard work, fantastic results of the videos! I appreciate all the work you have done in the past for us, and I have thoroughly enjoyed working with you. You are the ultimate professional and your work is superb. You did a great job on this project!! Thanks for the commitment on your part and the quick turnaround! This is great, thanks. It’s a great product, and we loved doing it. It’s been great working with you and your staff!